The CUNY-wide subscription to the Chronicle of Philanthropy website seems to be disrupted and is being looked into by the CUNY Office of Library Services. See our A-Z journals search for full text coverage elsewhere. The journal platform, Emerald Insight, is getting a major redesign scheduled to launch this July. If you’d like to look at the beta, which has only basic functionality and is not something that is ready for our researchers yet, you can see it at https://beta.emerald.com/insight. 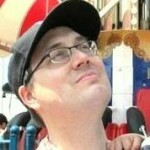 There is a link at the top of the beta site where you send feedback to the developers. Recently, I helped a student who had grabbed the URLs from the address bar of their browser when they had found a few articles. They were wondering why the URLs would no longer take them to the articles. The student sent me the URLs hoping I could figure out how to get back to the articles they had found. Usually, when we get questions like this, it’s common to tell the student they’ll need to run their searches again because the URLs they have are useless. Actually, though, with some detective work and depending on the database, you can find your way back to specific articles from these URLs. Here’s how you do it. There is an EBSCO support page that lists all their databases with their three-letter codes. I went to that page and used CTRL-F to search the page for the “bth” code. From there, I learned that is the code for Business Source Complete. Another thing that is commonly in these URLs for EBSCO databases is the accession number for the article. Every article in EBSCO is assigned a unique number as it is added to a database. Looking at the URL, we can see a string of characters near the end with “AN=94886700” with “AN” being the code for “accession number” and the eight-digit number after it being the accession number for a specific article. The last step is to go into the right EBSCO database, paste in the accession number in the search box, limit the field search option to “AN Accession Number,” and run the search. Using that approach with the two URLs the student shared with me, I was able to find the articles and get the student permalinks. I think this same strategy may also work with Gale and ProQuest database URLs. I’ll look into it and do additional posts here if that is indeed the case. On the off chance that the LibGuides system goes down, we’d be without access to our A-Z database list. I’ve created a backup of the list in HTML and PDF formats. If you go to the Databases Overview page in our Library Services Wiki (access to this wiki is restricted to library staff), you’ll find links to those backup files at the top of the page. Yesterday I described how you can sign up to get blog posts delivered via email to you. One downside of the emails is that they only offer a snippet of the blog post; you have to click a link in the email to get to the full post on the web. 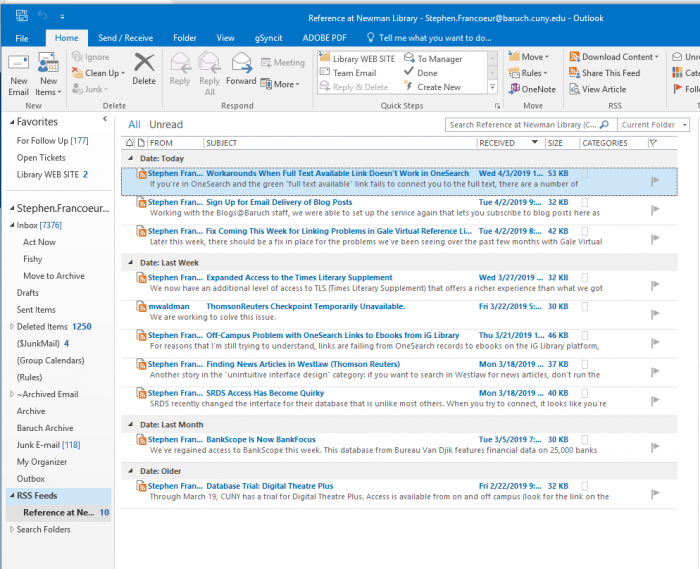 What if you wanted to have the full text of the blog post waiting for you in Microsoft Outlook? Having the full text also means that if you use the search feature in Outlook, it will find not only relevant emails but also blog posts. 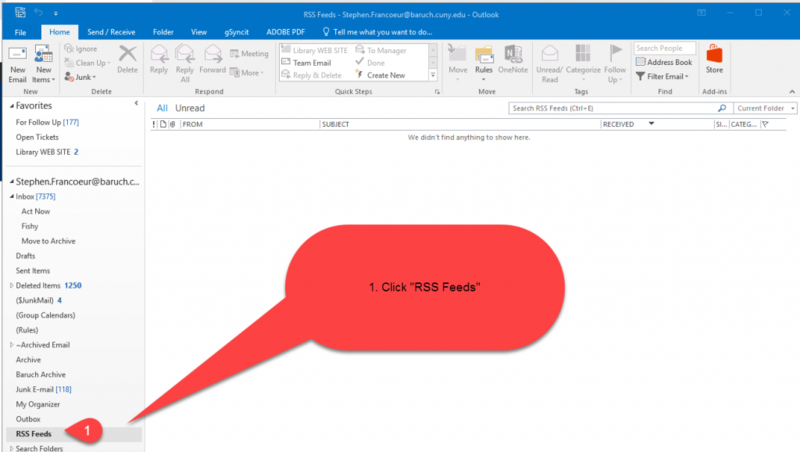 Here’s how you can set up the blog feed in Outlook if you’d rather get the posts that way. Step 1: In Microsoft Outlook, click “RSS Feeds” in the left sidebar. Step 2. Right mouse click to open the RSS Feeds menu. Step 3: In the “New RSS Feed” box, copy and paste the blog feed URL and then click the “Add” button. Step 4. Click the “Advanced…” button. 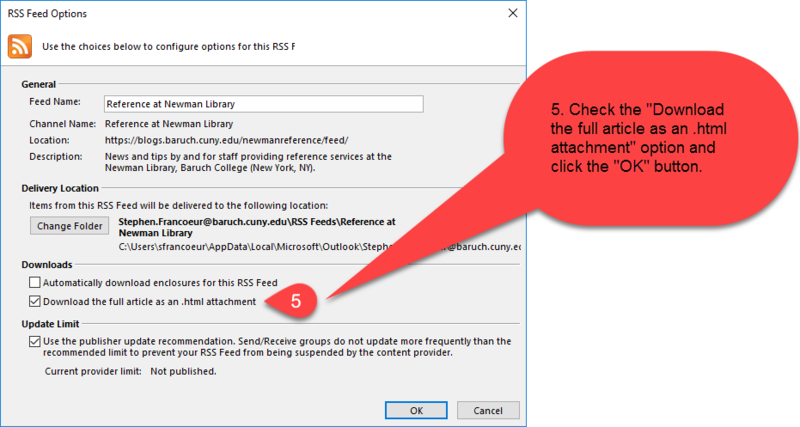 Step 5: In the RSS Feed Options box, check the box for “Download the full article as an .html attachment” option and then click the “OK” button. 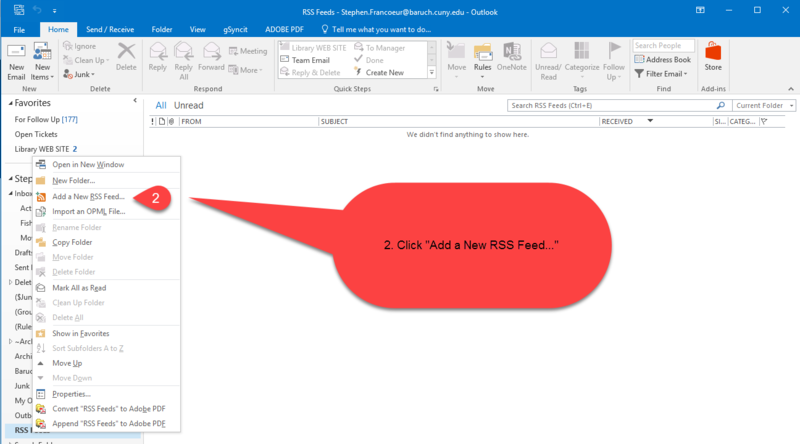 You should now see the blog posts in the “RSS Feeds” section of the Outlook interface. 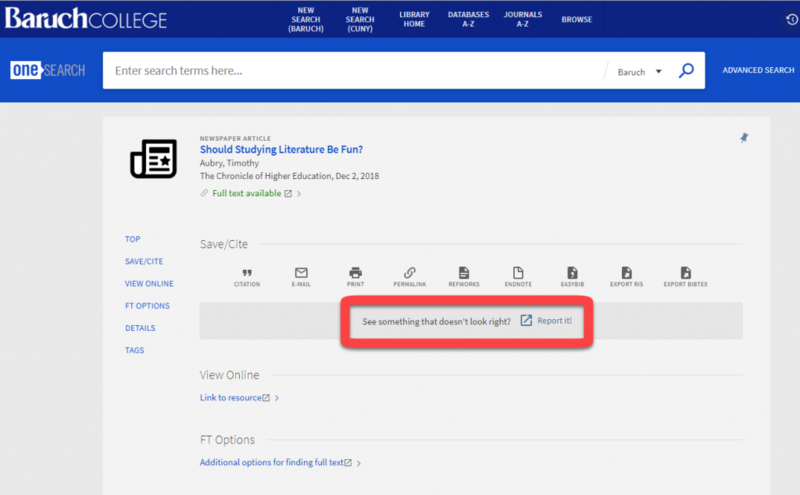 If you’re in OneSearch and the green “full text available” link fails to connect you to the full text, there are a number of workarounds you might want to try. Once clicked, a SFX menu will open in a new browser tab showing other databases where full text may be found. If you’re in OneSearch, the easiest way to get to Serials Solutions is to click the “Journals A-Z” link at the top of the interface. 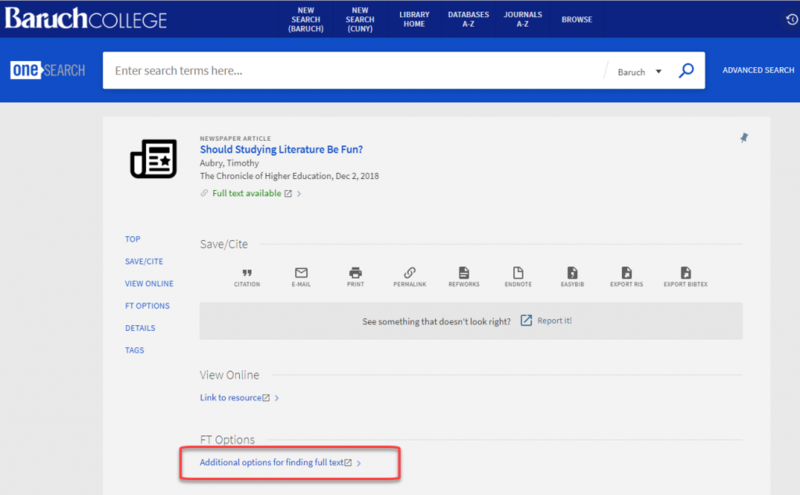 If the item is an ebook and the full text link isn’t working, try going to the A-Z databases page, connecting to the appropriate ebook database, and running the search there for the ebook. This isn’t a workaround but a plea to share with Michael Waldman and me any OneSearch record that fails to connect to full text. Every OneSearch record should have a “Report it” link you can use to quickly notify us of a problem. Working with the Blogs@Baruch staff, we were able to set up the service again that lets you subscribe to blog posts here as they are published. On the right side of the blog, you’ll see a new “subscribe by email” box where you can enter your email address. Once you submit your address, look for a confirmation email message with a “confirm subscription” link in it that you need to click to complete the process. Later this week, there should be a fix in place for the problems we’ve been seeing over the past few months with Gale Virtual Reference Library and Nexis Uni. This problem always starts with OneSearch records. When the user clicks the “full text available” link for some (but not all) records that are supposed to lead into Gale Virtual Reference Library entries or into Nexis Uni, the user is led to various dead ends. Until the fix is in place this week, users should take note of the info from the OneSearch record for the item they want, go to our A-Z databases page, find the link for either Gale Virtual Reference Library or Nexis Uni, connect to the appropriate database, and re-run the search for that specific item. The source of the problems lay in the updates made by Ex Libris to holdings info about Gale resources and Nexis Uni resources in the SFX system (a system that you also see when you encounter a “Find it! @ CUNY” button in a database record. When you click the “full text available” links in OneSearch, that action uses SFX to figure out what database has the full text and takes you directly from OneSearch to the item in the database (in some cases, the link takes to you to the search page for the database). Ex Libris is fixing errors it made in the way SFX translates incoming requests for full text linking for Gale and Nexis Uni resources into a URL made on the fly that transports the user into the appropriate database. CUNY OLS will apply this fix to our SFX server this week, and we should see the problems disappear thereafter.